Are These the Best Donut Shops in America? Do you remember when you first encountered a donut? Your eyes might have glazed over, but it was definitely love at first sight. The sugary and fluffy cousins of bagels, donuts just melt your troubles away when you sink your teeth into their bready goodness. 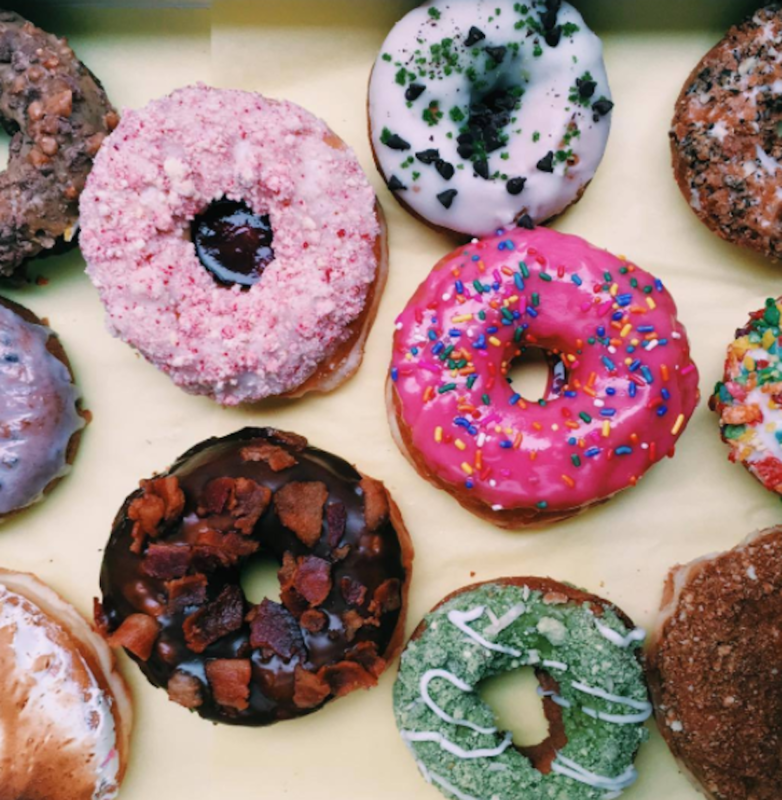 Let’s take a look at 18 of the best donut shops found in America! The Salty Donut is an artisanal donut shop and coffee bar focused on small-batch and chef-made donuts made from scratch and high quality ingredients. The Salty Donut loves small batches and big smiles, obsessed with using nothing but the freshest and most natural ingredients possible. The fillings, glazes, jams, and doughs are all made with high quality and care, creating an assortment of flavors that we all need to try. The Salty Donut has a weekly flavor menu, with flavors such as Old Fashion Chocolate Cake, Eggnog Creme Brulee, and Holiday Funfetti. The year round flavors include Nutella, Guava and Cheese, and Baked Cookies and Cream! We like our Donuts how we like our exes — Salty AF. When you look at pictures of Blue Star Donuts on IG, your eyes will glaze over — seriously though, it’s difficult not to fall in love with this Portland-raised donut shop. Founded in 2012, Blue Star Donuts are made from a classic brioche recipe, and the dough is carefully crafted with love and care, taking 18 hours to hand-make every day. Allie’s Donuts in Rhode Island has soft and fluffy donuts with delicious flavors including coconut jelly and maple frosted — you can get them “raised” (softer) or “old fashioned” (cakier). They even offer donut “sticks,” which are basically donut logs oozing with jelly or Boston cream. Oh and if you’re still wondering about that donut cake, make sure to order it at least a week in advance — they DONUT care for last minute requests! Located in Boston’s South End, Blackbird Doughnuts creates unique gourmet doughnuts in its artisanal doughnut shop. Blackbird Doughnuts aims to take pastries to another level, creating and combining classic flavors with new and interesting tastes, all while using as many natural and locally sourced ingredients as they possibly can! Some of the favorite flavors include Blackberry Lavender, Salted Toffee, and Honey Pistachio Lemon — our mouths are watering already. Tucked away off the street of Beretania, Champion Malasadas has chiffon cakes, buns, and malasadas — a Portuguese confectionary delight made of small balls of yeast dough that are deep-fried in oil, and coated with granulated sugar. Champion Malasadas has other pastries, including their guava, lemon, chocolate, and orange chiffon cakes! However, for only 85 cents, you can grab a warm, chewy, and eggy malasada to go! Cakey, crunchy, and tender AF, Da Vinci’s Donuts in Atlanta need to be in your mouth immediately. Their “cake-style” donut is unlike any other donut you’ve had before, with its tenderness surrounded by a slightly crunchy exterior, freshly made right in front of your eyes. Da Vinci’s Donuts are hand dipped and created at the counter, with over 20 different flavors and toppings. Their top flavors include Cinnamon Roll, French Toast, Salted Caramel, and Maple Bacon — and all sound like donut masterpieces! Donuts, slides, and brew? We’re on our way immediately. District: Donuts. Sliders. Brew. has cheeseburgers, fried chicken, coffee, and delicious donuts that are all made from scratch — including their sprinkles! The team doesn’t use pre-made mixes or artificial flavors and instead works to create all glazes and pastry cream fillings by hand. They offer seven rotating donuts every day, with over 100 options total, including their staples: glazed, cinnamon sugar, and chocolate glazed. Other flavors we’re dying to try are Peanut Butter & Jelly, Late Night Snack, and Samoa! Donuts in Chicago sure know how to Do it Rite with their flavors, freshness, and gluten free-ness! Do-Rite Donuts makes their donuts in small batches — never more than 36 at a time, to ensure love and care into each of their bready pieces of sugary heaven. Their goal is to deliver the freshest donuts every hour that they’re open, and they offer a great selection of gluten free and vegan donuts, made from scratch every day! Daily specials include Hummingbird, Pineapple, and Chai, just to name a few — and they’re all vegan! Do-Rite Donuts also serves deliciously brewed coffee and fried chicken sandwiches; who’s trying to roadtrip to Chicago anytime soon? We’ll chip in for gas and donuts. If Donut Byte Labs had to explain themselves in three words, it would be “Gourmet Mini Donuts.” They use a Donut Robot to make delicious mini cake donuts, each hand-crafted by skilled donut technicians and crowned with high quality toppings like hickory smoked bacon for both the bacon maple and candied bacon donuts. The flavors are endless: from the “Basic Flavors” category that include Plain, Glazed, and Powdered Sugar; to “Advanced Flavors” like Salted Caramel, Burnside Cream, and Lemon Drop! You can get boxes that are assorted, or even a square-foot box filled with more than three dozen mini donuts — we want a Byte of that for sure! With three locations, Donut Bar’s original shop is in Downtown San Diego, and is listed as the Number 1 Donut Shop from USA Today, Thrillist, and more! Their list of flavors is endless, from French Toast to Oh My Birthday Cake Oreo, to Raspberry Pistachio, and each donut is created heartily. The desserts are fluffy and dense, filled with sugary goodness and topped with anything imaginable — sprinkles, frosting, and powdered sugar, to name a few! Donut Savant in Oakland, CA offers three different donut sizes: donut holes, mid size, and regular size. The holes are made of a buttermilk cake batter and are less than $1, while the mid-size is about twice the size as the donut holes, and the regular size is that of an average size ring donut. You can even customize the type of dough you’d like, from cake based dough with velvety and chewy exteriors and dense interiors, to the raised dough with yeast raised dough and lighter than the cake based. With flavors such as Boston Cream, Salted Maple Hole, and the S.O.S. (raised dough filled with seasonal fruit jam), you can order these goodies for a next day pre-order, or even up to 2 weeks in advance! Donuts at General Porpoise are made from fresh eggs and are filled with seasonal jams, custards, and creams. General Porpoise salutes all flavors, from the classics such as vanilla custard or berries and cream, to the new faves such as roasted lemon curd and apple butter. You can even grab yourself a delicious cup of espresso while you’re there, or you can pre-order these babies online! Generally speaking, these donuts look like they’re filled with creamy goodness and serve a great Porpoise of making our mouths and tummies happy! Makers of handcrafted extraordinary donuts, Glazed Donut Works in Texas prides itself in its small batches and huge satisfaction. Known for their prettier than pink boxes, Glazed Donut Works offers incredible flavors such as maple bacon, blueberry mascarpone, and creme brulee — it’s no surprise that the line goes out the door for almost all hours of operation, staying open late during the weekends for all the midnight snackers. For those of us who can’t choose between sweet and savory, Glazed Donut Works offers the “do-lache,” which is a crossover between a doughnut kolache stuffed with maple-blueberry smoked sausage and topped with maple glaze. Glazed Donuts definitely does the Works with its unique menu of flavors! If you’re looking for gourmet donuts in Houston, look no further! Hugs & Donuts offers donuts so outrageous and unique, and filled with such delicious goodness, that your mouth will want to hug the donuts immediately. Here, you can get yeast donuts like The Homer, made with homemade strawberry icing and sprinkles. There’s also a selection of cake donuts, such as the Chocolate Toffee Latte and the Hibiscus with Mango Chips, as well as Fritters of the Day (Apple, Blackberry, or Peach). Also, if you’re feeling indecisive, Hugs & Donuts offers kolaches like Sausage & Pepperjack, as well as The McLovin — scrambled eggs, hashed browns, breakfast sausage, and cheddar. Making the finest donuts for over 77 years, Oram’s Donut Shop makes donuts the old-fashioned way, promising all their tasters that you can immediately see and taste the difference in comparison. They pride themselves in staying true to themselves and pushing out quality over quantity, and for Oram’s, size does matter. Donuts at Oram’s are much larger than the average — their cinnamon rolls are often twice the size of others! Their original flavors include Oram’s homemade donut filled with cream and icing, jelly fillings such as strawberry and blueberry, and their cake and raised donuts. Seasonal donuts include Key Lime Pie, Pumpkin Glazed Cake, and Orange Creamsicle! Founded by Kenneth “Cat Daddy” Pogson and Tres Shannon, Voodoo Doughnuts started out as an interesting business idea to fit into the extraordinary Portland business climate — something fun, unique, and long lasting. Unknowing of how to actually make a donut, the two traveled to California to learn the craft from donut masters, and the rest is history! Voodoo offers donuts, bars, and even a donut shaped into a voodoo man, all with unique names and flavors. Try the new Pot Hole doughnut, a chocolate bar filled with cream, and topped with Oreos with a trail of frosting “for adhering to the proper side of the road to eat first.” Careful though — these donuts might contain wheat, soy, and voodoo magic (just in case you’re allergic). Established in 2012, Sidecar Doughnuts was created with the intent to create a beautiful and new type of gathering place for their community, a place that offered perfectly hand-crafted doughnuts, that is. Sidecar offers daily flavor menus, monthly selections, and gluten-free options for their small-batch baked donuts, guaranteeing customers a fresh and warm treat as they’re made every hour. Grab yourself a Saigon Cinnamon Crumb, a Malasada with Huckleberry Jam, or a gluten-free Lemon & Thyme donut and you’ll forget about the Side-carbs that you said you’d be counting this 2017 (shh, no one has to know). The story of the Doughnut Plant’s roots begins in 1910, with founder Mark Israel’s grandfather working in a bakery in Minnesota. The stories grow throughout the decades, and so do the pastry techniques, where Mark invents the Jelly-Filled Square Doughnut in 2004. The Doughnut Plant develops its own style and flavors, creating mini doughnuts, homemade jelly doughnuts, rosewater-infused glaze and cream filling, and has opened partner bakeries in Japan. Scattered throughout New York City, the Doughnut Plant offers yeast, cake, and filled doughnuts. The original square doughnut is still available, as are new flavors such as Carrot Cake and Tres Leches. In celebration for 12 years of Doughnut Plant Tokyo, the “Taste of Japan” flavors are hitting the bakeries; try a Yuzu, Black Sesame, and Matcha Green Tea flavored doughnut now!